Sermon on January 26, 2014 - Incredible possibilities await when we dismiss the negative ways of life. Looking at Tumanyan's Anush, and the examples of life, Fr. Vazken takes the congregation on a journey that even gets the bumblebee into flight. Recorded LIVE at the St. Peter Armenian Church Youth Center in Glendale. Sermon delivered by Fr. Vazken Movsesian on January 6, 2014 - On the Revelation of God and its meaning to us today. Recorded LIVE at the St. Peter Armenian Church and Youth Ministries Center. January 5, 2014 - Fr. Vazken speaks passionately about the joy and disappointment of this Christmas Eve. In a world that is void of "Glory to God," "Peace on Earth" and "Good Will Among Men" - how to make the Christmas Message of Hope real. 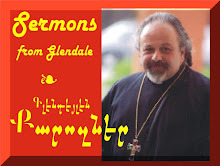 Sermon delivered and recorded LIVE at the St. Peter Armenian Church Youth Ministries' Center in Glendale, California. Armenian language at beginning. English language sermon begins at minute 11:00.